(a) Wear modelling and validation. This includes modelling of fundamental mechanisms as well as the modelling of tribosystems. Approaches may employ contact mechanics, frictional considerations and lubrication concepts in the development of the model, and will always include physical validation of the model. (b) The development and use of new wear testing methods and standards. This includes the rationale behind their development (including a critique of existing test methodologies where appropriate). (c) New wear diagnostic tools. The need for these tools and examples of their use in either basic research or engineering should be illustrated. (d) The development of wear-resistant materials, coatings, or surface treatments. Such papers should include, for example, benchmarking against materials currently employed in targeted engineering applications, or presenting a basic hypothesis underlying the work that can be validated as an advance over the current state-of-the-art. The criteria used to select the test methods employed (and the conditions under which those tests were conducted) must be robustly justified with regard to the targeted engineering applications. 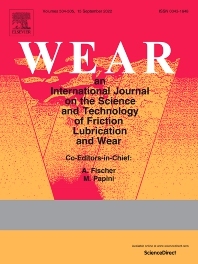 The proposed mechanisms of wear must be discussed in the context of data and observations that support those conclusions. (e) Relationships between the composition, structure, properties, and processing of materials and their wear behavior. Such submissions should include the basic rationale for the work, its foundation in prior knowledge, and how the current approach is implemented to explore these relationships. The criteria used to select the tests or analytical methods employed shall be explained with respect to the purpose of the research, be it fundamental or applied. (f) The role of lubricants or other interfacial species in the wear of materials. Such submissions will focus on the mechanisms of wear in the presence of well-characterized interfacial environments.